The local team of riders and organizers at Pelotonia: Top Row - Conner Eckles; Richard Penwell; Shelby Miller; Kaleb Eckles; Susan Eckles; Leslie Darif; Milan Hansen; Kate Darif. Bottom Row - David Darif; Trey Tompkins; Angie Curtis; Kellie Chambers; Cheryl Fisher; Eric Darif. Not Pictured - Mark Fisher; Don Pop; Mike Callahan; Tony Merrit; Matt Pettit. Over 8,000 bike riders and 3,000 volunteers recently came together to coordinate one of the largest events in the state. The numbers will be very impressive, but it is the message that weighs heavy: One Goal. End Cancer. Peloton means the main field or group of cyclists in a group. With Pelotonia, the entire field is the main group and on Aug. 4 in Columbus, each individual rider dedicated their energy into fundraising and training for a long trek. For some, the miles could be between 25 or 200, and pledges for donations ranged from $1,250 to $2,500. Considerable effort goes into this cause. One hundred percent of every dollar raised from Pelotonia goes directly to The Ohio State University Comprehensive Cancer Center – Arthur G. James Cancer Hospital and Richard J. Solove Research institute. Within the Pelotonia bikers, a group of Fayette County riders pulled together before this event and became a team. L-Brands, a fashion apparel company with brands such as Victoria’s Secret and Bath and Body Works, offered a “price match” to any of their employees’ team fundraising. 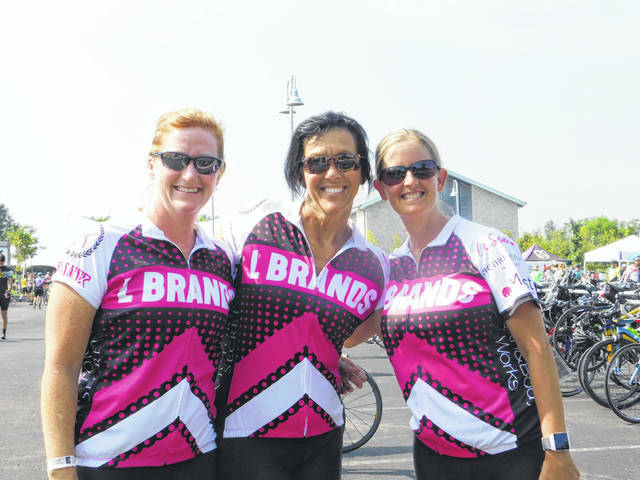 Kate Darif, who works at L-Brands, welcomed any local riders who were willing to join the fight. Whatever was raised would become doubled. Matt Pettit at Streetside 62 offered to host a third-annual community fundraiser in which riders would seek out items to be auctioned. This event allowed citizens of the area to make bids on select products donated from local businesses and friends. It was true community collaboration. “The event really couldn’t be possible without sponsors. I had no problem asking businesses to be a sponsor for our event because this isn’t about me. It’s about something much greater,” said rider, Susan Eckles, who rode 100 miles for the event. Sponsors were Marquee Construction, Sugarcreek Packing, Wall Dentistry, Fayette Memorial Hospital, Halliday Lumber, Unlimited Concrete Solutions, Rocking Bar M, First State Bank, and Jim Gusweiler Autogroup. Numbers began coming in with the conclusion of the fundraising benefit on July 28, but nothing was conclusive yet. There was still a week left until Pelotonia officially kicked off and donations would still be coming in. Richard Penwell, local resident and bike rider, talked about what inspired him to ride. “My wife is undergoing her second bout with cancer. I felt like it was the right fit to ride in her name and to do something good, so I signed up to ride the 100 miles,” he said. It is common for riders to ride in the name and honor or memory of somebody who has been diagnosed with cancer. Eric Darif shares an inspiring story from his first day of riding. In all, the Fayette County bikers rode 2,025 hot and hilly miles, and collectively, their fundraising efforts have come to a total of $103,500 and still climbing. The local team of riders and organizers at Pelotonia: Top Row – Conner Eckles; Richard Penwell; Shelby Miller; Kaleb Eckles; Susan Eckles; Leslie Darif; Milan Hansen; Kate Darif. Bottom Row – David Darif; Trey Tompkins; Angie Curtis; Kellie Chambers; Cheryl Fisher; Eric Darif. Not Pictured – Mark Fisher; Don Pop; Mike Callahan; Tony Merrit; Matt Pettit. 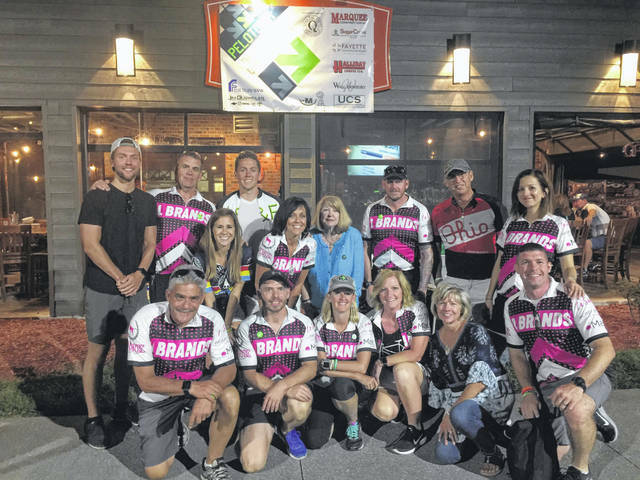 https://www.recordherald.com/wp-content/uploads/sites/27/2018/08/web1_received_2337456582938764.jpegThe local team of riders and organizers at Pelotonia: Top Row – Conner Eckles; Richard Penwell; Shelby Miller; Kaleb Eckles; Susan Eckles; Leslie Darif; Milan Hansen; Kate Darif. Bottom Row – David Darif; Trey Tompkins; Angie Curtis; Kellie Chambers; Cheryl Fisher; Eric Darif. Not Pictured – Mark Fisher; Don Pop; Mike Callahan; Tony Merrit; Matt Pettit.